These bobby pins are beautiful with rose, clear and fuchsia crystals. It is brilliantly sparkling, making it a prefect hair accessory for a party. Thes bridal bobby pins are perfect modern twist to your bridesmaid hairstyle. 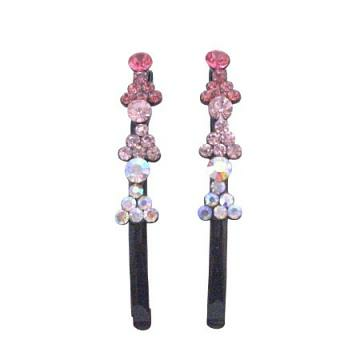 Buy Fuchsia Rose Clear Crystals Black Hair Pin Jewelry, sold & shipped by Fashion Jewelry For Everyone where you can shop online for Leading Online Retailer for Indian Fashion Jewelry.